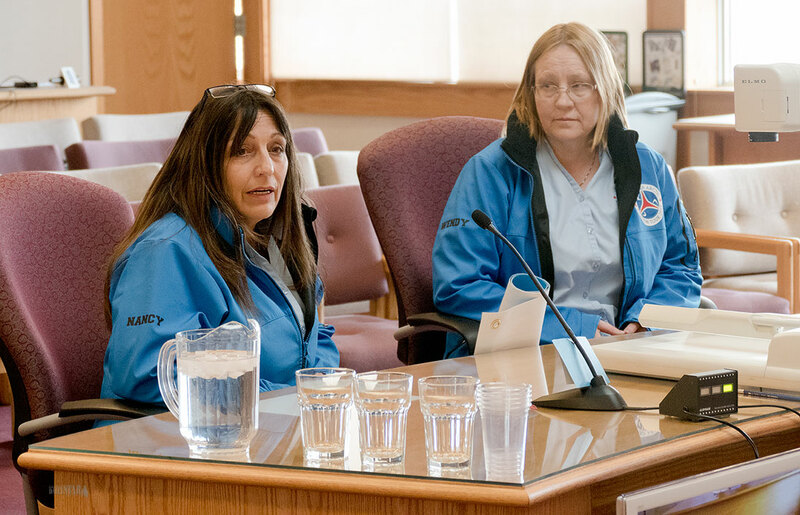 EXPLAINING THE PROPOSAL – Nancy McClure, left, and Wendy Fowler make their presentation on the Canadian Arctic Aviation Tour – Wings Over The North 2017 on Monday evening before city council. 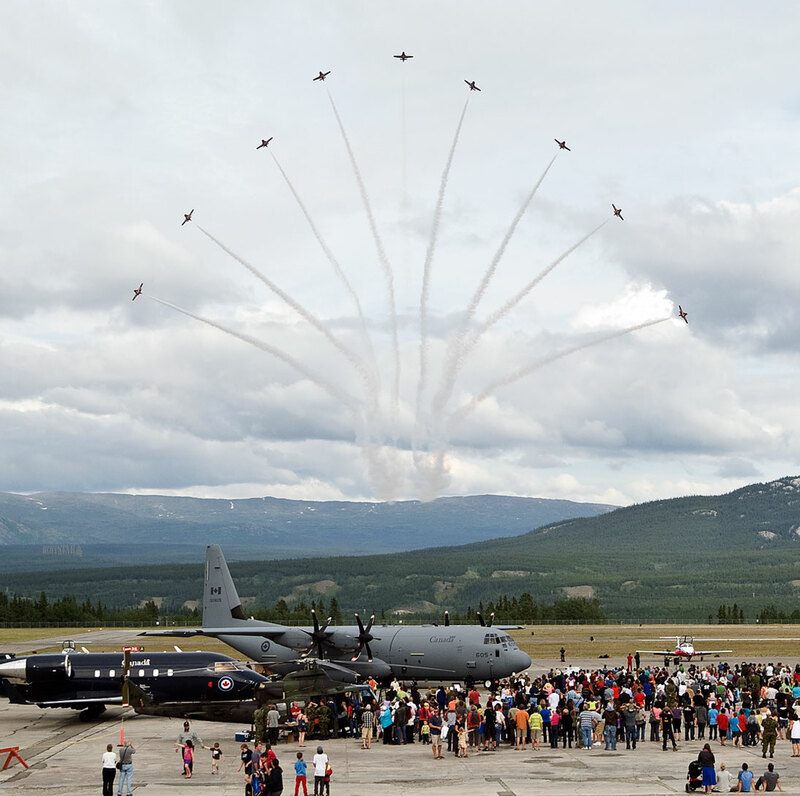 AN APPRECIATION FOR AVIATION – Air shows are always popular spectator events in Whitehorse, as witnessed by the Snowbirds’ visit and a static display of aircraft (above) in 2012. An air show celebrating the nation’s birthday and the role aviation has played in the North could be on its way to the Yukon. Officials with the Canadian Arctic Aviation Tour 2017 – Wings Over The North outlined their plans to city council Monday night. The $8-million event is awaiting federal funding approval, with some funding also coming from private sponsorships. It would be part of Canada’s 150th birthday events happening across the country, with shows in 97 northern communities spanning from the Yukon to Labrador. Nancy McClure, one of the tour’s organizers, is in the city for the Northern Air Transportation Association’s conference. She told council the project aims to bring a major sesquicentennial event to part of the country that won’t be getting the major events around the celebration bigger cities in the south will be seeing. In the Yukon, there would be air shows taking flight beginning June 2, 2017 in Fort Liard, Watson Lake, Whitehorse, Haines Junction, Dawson City and Old Crow. “Wheels down” shows showcasing aircraft on the ground would also be held in the Ibex Valley, Carcross, Mt. Lorne, Marsh Lake, Tagish, Teslin, Faro, Ross River, Carmacks, Destruction Bay, Burwash, Beaver Creek, Pelly Crossing and Mayo. After the Yukon, the tour would move into the Northwest Territories. Exactly what planes would be featured in each community is limited by runway capacity. “Whitehorse would be one of our major shows,” McClure said. Groups like the Canadian Forces Snowbirds and the SkyHawks Parachute Team would perform along with the civilian pilots who are organizing and would be flying throughout the 2 1/2-month tour. Plans are already in place to have a team of SkyHawks accompany the entire tour, carrying the Canadian flag across the Arctic. Most of the participants – with the show expected to bring about 70 people into town – would be civilians. As it’s stated on the tour’s website (canadianarcticaviationtour2017.com/): “The Canadian Arctic Aviation Tour 2017 is a non-profit group bringing an amazing event to the North. “They can STILL have an Amazing Canada 150 event as it will be brought to them … in the form of an airshow like these people will never have experienced before. “Our Canadian Arctic Aviation Tour 2017 consider the air show to be the conduit to the legacy pieces that will have impact for many years to come. ‘Wheels down’ shows wherever possible and ‘wheels up’ or above community shows at all other locations. Along with staging the air show, the large legacy component of the initiative, McClure stressed, would include education, heritage and culture. It’s also expected there would be involvement of local air cadet squadrons and the Canadian Rangers, among others. Youth involvement is a major focus of the event. It would also require volunteers from communities. While the group did not come to council to ask for funding, McClure noted it will be looking for in-kind assistance down the road in the form of emergency services being on-site and the like. She said the group has also met with Yukon government officials, airport authorities and other organizations that could be involved. The Whitehorse show would take place June 4, 2017. The Yukon start is largely for weather reasons based on historical weather patterns. Comprised of experienced pilots, the organization is planning for delays. “We will run into weather (problems),” McClure said. The group has not looked closely at the potential economic impacts communities could see with an air show – something it might look at closer to the event. McClure, however, said there are some obvious benefits in the hotel rooms and rental vehicles that would be booked by the visitors. Council members asked questions about funding and logistics, and suggested contacting the Yukon Convention Bureau for assistance. Later, Mayor Dan Curtis told reporters he’s excited about an event that will both celebrate Canada’s birthday and the role aviation has played in its history. “It’s a big part of the North,” he said. Coun. Dan Boyd was absent from the council meeting. This is fantastic and we don't even have to travel to Abottsford to enjoy it. Can't wait to see those antique tudor jets again. Spect they'll be still flying on Canada's two hundredth birthday in 2067. Since Canada's military budget is now paying for those refugees don't expect to see anything modern in my life time.